News continues to emerge days before Egypt’s presidential elections indicating that the Islamists are relying on any and every strategy to gain votes for their pro-Sharia candidates. As we just saw, any number of Islamic authorities—from Yusuf al-Qaradawi to the Sharia Body for Rights and Reform—said that it is an “obligation” to vote only for those Muslims who plan on implementing Sharia law, while it is “forbidden” to vote for any of the secular candidates. In other words, the threats of hell fire are being used to influence Muslims at the voting booths. But beyond threats and commands are sheer bribes—or, in the following case, a sort of Islamic “bread and circuses.” As they wereaccused earlier, the Muslim Brotherhood was just caught bribing Egypt’s poor with packets of food. 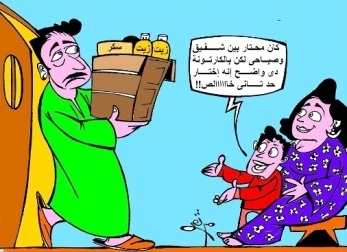 Yesterday an Egyptian activist posted a video on YouTube about “the Brotherhood’s scandal: they buy the votes of the poor through food and drink.” The video shows several poor women sitting with bags of food from the Muslim Brotherhood’s “Freedom and Justice” party. The Egyptian activist keeps asking them, “Really, is that how they bought your vote?” even as the women hide their faces and leave.As we just saw, any number of Islamic authorities—from Yusuf al-Qaradawi to the Sharia Body for Rights and Reform—said that it is an “obligation” to vote only for those Muslims who plan on implementing Sharia law, while it is “forbidden” to vote for any of the secular candidates. In other words, the threats of hell fire are being used to influence Muslims at the voting booths. Bribery is a form of deceit, and these presidential elections are something of a war for Egypt’s future, so, considering that Islam’s prophet Muhammad famously declared that “war is deceit,” all of the aforementioned approaches become legitimate.